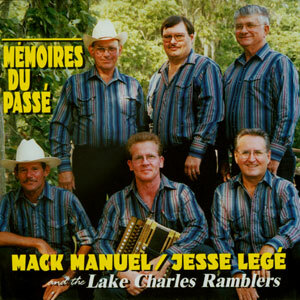 Mack Manual & Jesse Lege with the Lake Charles Ramblers are a popular dance band in the Lake Charles/Southeast Texas area. Mack Manual attributes his interest in playing Cajun music to Jesse Lege. In 1988, Jesse was playing with the Jeff Davis Ramblers, and Mack admired Jesse’s accordion playing and singing so much, he learned to play the triangle just so he could eventually join that band. Jesse, who was inducted into the Cajun Music Hall of Fame in 1998, sings in the traditional high pitched emotional style reminiscent of the late Iry Lejeune and plays accordion with equal power and conviction. Barry Ancelet describes this band as ‘an authentic Cajun dance band’.